In recognition of the state's responsibility to minimize its environmental footprint and maximize its role in contributing towards the health of our environment, California State departments are adopting a green way of thinking about their fleet. Under the leadership of Governor Edmund G. Brown Jr., California has undertaken an ambitious effort to promote a reliable, environmentally responsible and cost effective fleet. In 2007, legislation was passed that established a goal of reducing or displacing the consumption of petroleum products by the state fleet by 10 percent in 2012 and by 20 percent in 2020 (compared to a 2003 baseline). As of January 1, 2017, the state met and exceeded 2020 goal of reducing petroleum consumption by 20 percent. Please see the chart below for the state's year-over-year progress in meeting these petroleum reduction goals. To further reduce petroleum reduction and greenhouse gas (ghg) emissions, in 2012 Governor Brown issued Executive Order (EO) B-16-12 mandating that at least 10 percent of state fleet purchases of light-duty (LD) vehicles are zero emission vehicles (ZEV) by 2015 and 25 percent by 2020. 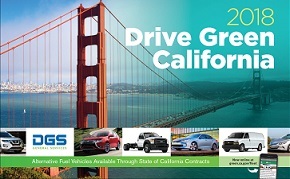 In 2016, Governor Brown issued the 2016 ZEV Action Plan which increased the ZEV percent of state fleet purchases of light duty fleet assets to 50 percent by 2025. Additionally, in 2016 the California Department of General Services issued statewide policy that mandate five percent annual increases to the ZEV purchasing thresholds, starting in fiscal year 2017-18. Vehicles having special performance requirements necessary for the protection of public safety and welfare are exempted from this mandate. Since the EO took effect the state has exceeded the annual ZEV purchasing thresholds in each given year and, as of 2018, has approved purchase requests for over 850 ZEVs. Please see the chart below for the state's progress in meeting these ZEV purchasing goals.